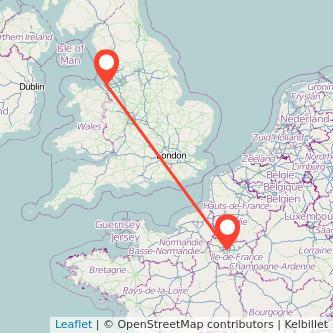 The trip between Liverpool, located in England and Paris, situated in France is well connected by trains. The trains are run by the following train operators: Virgin Trains. The train is a fast and simple solution to travel to Paris from Liverpool. The average train duration between Liverpool to Paris is 7h17m to travel the 391 miles. We found trains from £65.00 to travel in the next 30 days. Fares can change depending on when you travel or how long in advance you buy your ticket. Find the cheapest tickets to travel from Liverpool to Paris by train, bus, ride sharing and plane. The chart above illustrates the best prices found over the last six months depending on how much time in advance the ticket is purchased. Purchasing your train from Liverpool to Paris in advance will enable you to pay less for your train. The cheapest tickets we found were from £80 when purchasing your train 15 days in advance which is 67% cheaper than the best price we found when purchasing your seat 1 day in advance. We compare train ticket for all major companies to travel between Liverpool and Paris by train and find the best prices for the coming days. Take a look at the prices of train tickets Paris to Liverpool and find the best deal for your outbound journey.